The business was one of nine food businesses to be closed by inspectors in January. The Quays Restaurant was closed for over a week after an inspection last month. NINE FOOD BUSINESSES were ordered to partially or fully close after being found in breach of food safety legislation in January. According to the Food Safety Authority of Ireland, reasons for the closures included cockroach infestations, mouse droppings and putrid odours. The restaurant was closed for over a week after food safety inspectors found “an active cockroach infestation” during a visit on 8 January. The report recorded that the infestation included cockroaches “at all stages of the lifecycle” and that there was “a cockroach trap under the cooker area”. The report noted that both live and dead cockroaches were found. The order was issued under the FSAI Act 1998 on 8 January and subsequently lifted on 16 December. The full text of the order can be seen here. The Kitchenette Medical Assessment Unit and the Kitchenette Female Medical Ward were closed for three days after a visit on 2 January. A report from the pest control company on 31 December stated that there was a “small rodent found dead in kitchen of medical assessment unit”. A subsequent inspection on 2 January by HSE inspectors recorded “rodent droppings found behind kitchen equipment ” and evidence of “inadequate pest proofing of external drains”. The order was issued under EC Official Control of Foodstuffs Regulations 2010 on 2 January and subsequently lifted on 5 January. The restaurant was closed for one day over a failure to implement “adequate procedures to control pests”. The report stated that there was “widespread evidence of mouse infestation” including “mouse droppings found on the floor…underneath where you reheat rice”. The order was issued under the FSAI ACt 1998 on 29 January and subsequently lifted on 30 January. The take away was closed for five days due to evidence of a “rodent infestation” that included “droppings found in the kitchen and dry good store”. The report also noted “a serious accumulation of waste” resulting in a “putrid odour”. The order was issued under the FSAI ACt 1998 on 23 January,and subsequently lifted on 28 January. Sushida, Unit 1, Malpas Court Clanbrassil Street, Dublin 8. Part of the take away business was forced to close. This included “the storage, handling and preparation of sandwiches and sandwich fillings”. The report found that the premises “does not offer sufficient space to permit adequate cleaning”. The order was issued on 16 January under the EC Official Control of Foodstuffs Regulations 2010. Part of the take away business was forced to close. This included “the activity of the preparation, storage and sale of sushi and associated products”. The order was issued on 16 January under the EC Official Control of Foodstuffs Regulations 2010 and was lifted on 21 January. The report said this was likely to “pose a serious risk of contamination” to foodstuffs. The order was issued under the FSAI ACt 1998 on 16 January, and subsequently lifted on 25 January. The take away was closed for two days after an inspection found there was “no obvious cleaning in recent times” and a “failure to maintain an clean the premises”. The order was issued under the FSAI ACt 1998 on 15 January and subsequently lifted on 17 January. The take away was closed after an inspection found “food workers on site at the time of inspection had no formal food hygiene training” and were unable to answer questions about required temperatures. The report stated that there was an inadequate number of fridges leading to “raw chicken being stored in a bowl sitting directly on top of a saucepan filled with cooked rice and next to ready to eat salad items”. The order was issued under EC Official Control of Foodstuffs Regulations 2010 on 11 January. 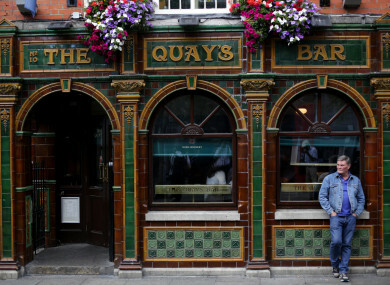 Email “The Quays Restaurant in Temple Bar was closed after 'an active cockroach infestation' was found”. Feedback on “The Quays Restaurant in Temple Bar was closed after 'an active cockroach infestation' was found”.